Retailers, financial-services firms, telecommunications companies, utilities and terminal manufacturers will be instrumental in the developments that change how new consumers choose what to consume, how they make purchases and payments, and how they communicate with service businesses over the coming years. Reply supports all the main players in the processes of creating and delivering innovative Mobile Commerce services. Much more than a simple app, a mobile wallet integrates with the payment networks, CRM systems, in-store infrastructure, and marketing channels. 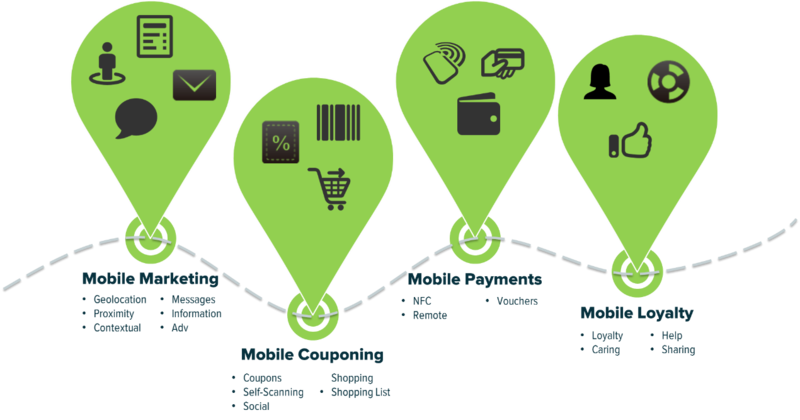 Mobile wallets provide structured data for customer analytics and customer insight. Through our digital promotion & couponing platform linked to a mobile wallet, Reply backs business by enhancing customer engagement and redefining their customer journey. Reply’s mobile-couponing solution drives better sales performance through context-sensitive, profiled offers and improves customer loyalty and retention. Discount policies can be tailored for different points of sale, product types and customer profiles, thus encouraging impulse buying while supporting cross-selling/up-selling efforts. By exploiting proximity marketing and geofenced marketing & advertising techniques, Reply enables companies to create real-time, targeted, context-sensitive marketing campaigns based both on the customer history and on information available in real time. We exploit the potential of technologies like the beacons that allow customer behaviour in physical shops to be analysed in real time. proven experience in devising and implementing advanced solutions that reach customers both in digital contexts and in-store. Reply developed Costa App, the new smartphone app of Costa Crociere, that combines the magic of Costa Crociere’s cruises, with an unprecedented digital customer journey. The launch of the new app is part of a comprehensive omnichannel strategy, which includes a re-evaluation of all Costa Crociere digital touchpoints.